Relatively Retiring: Rhubarb is Better Than Palm Trees. Rhubarb is Better Than Palm Trees. 'Zhoen' has just shown her tiny garden, so I'll show mine. This is a tiny area of my garden, but a most valuable one. I can step out of the back door and pick loganberries, strawberries, fresh herbs, raspberries, and soon, tomatoes. I have a productive blueberry bush in a pot, which doesn't show here. But best of all, I can pull a few sticks of rhubarb. I love rhubarb, and the place where it grows used to house a Chusan Palm. The rest of my garden is complicated and labour-intensive. I like to grow large, spectacular things, and the Chusan Palm was one of them. I was very pleased with it until I realised it was beginning to peer in at the kichen window, blocking the light. I filled the resultant large hole with compost and a crown of rhubarb. Two years on - Rhubarb Fool, Rhubarb Tart, Rhubarb and Loganberry Crumble. This little space wouldn't do for a family, but it is more than enough for me and my guests. Next year I'll do more with salad crops in grow bags, and I'll plant more herbs in the crevices of the paving, but I won't need to increase the space, which is about two metres square. Labels: rhubarb, rural life, tiny gardens. Did you know that (according to my quizzy friend) there are only 2 perennial (eatable) vegetables which grow outside in Britain? Rhubarb and asparagus. So he says and, right enough, I couldn't think of any others. 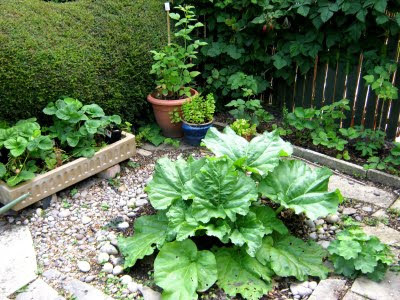 I must try rhubarb here - there isn't much space but I have peas potatos and herbs doing well in large pots and i'm contemplating taking out some pretty uninspiring shrubs and having raised beds - all takes time though! Lovely to see you last week. Isabelle: I'm keen on asparagus too, but I live in the heart of Asparagus Land and can buy direct from growers at their farm shops. P.Pete: Ho ho! Nice one! GZ: An interesting suggestion, which I'll explore. Thank you. Jane: Rhubarb is better than uninspiring shrubs as well as palm trees. It likes gallons of water - it gets all my washing up water. Yes, a most serendipitous meeting! I like the idea of a tiny kitchen garden. I am glad someone else likes loganberries! you can't get them in the shops here. 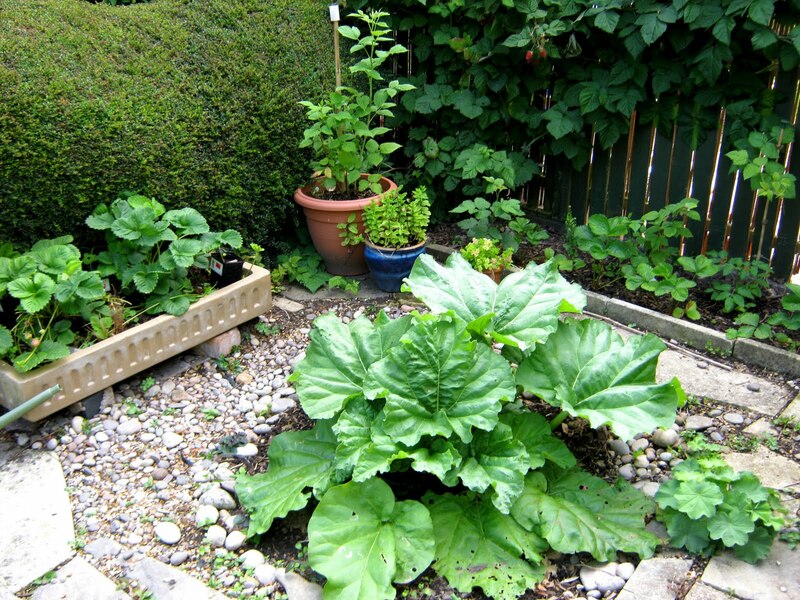 Rhubarb grew in a corner of the backyard when I was small, near the garage and fence, a disused space. I loved it, snapping off a slender stalk, and crunching it, always loved sour best of all. The alternative was Mrs. Rizzardi's green grapes, through the fence, from her arbor. Most of all the underripe, cheek-suckingly sour grapes. Jenny: It becomes challenging to cram the space. The loganberry tends to sprawl about, but it's worth it for the fruits. I think they are too sour for many tastebuds. Zhoen: That 'cheek-suckingly sour' description really sums it up! You have very fortunate guests, Relatively Retiring. Oh, thank you, Frances. I try to look after them well and make them eat their five a day! Funny, I have been craving rhubarb crumble and thinking of the plants in my French garden, alas, too far to pick right now. I ordered a couple of puds from Tesco, alas, not good, not good at all. Isabelle, sprouts? I know that most children consider them non-edible but are they not perennial? My favourite rhubarb recipe is Rhubarb and Ginger Cake. It has ground ginger in the batter with chunks of syrupy preserved ginger and half-inch lengths of raw rhubarb stirred in. It's good cold and even better hot. I leave my scarlet runner beans in the ground from one year to the next. They put out shoots as soon as the soil has warmed enough and much earlier than any seeds I've planted. You could try scarlet runners, too, R.R. They crop prolifically all summer and autumn and don't take up much room because they grow up rather than out. I love your rhubarb fool. I'm a very grateful guest who is looked after very well! Thank you. J: Maybe the craving for something sour is associated with being unwell? Hope you're better soon. Peregrina: That sounds good - could you email me the recipe sometime? The beans are a nice suggestion, but the loganberry takes up the fence space on one side, and there's a great big vine on the other - unless, of course the beans might strangle the vine? Beth: I'm sorry other visitors stopped you getting enough! Better luck next time. I'm glad your rhubarb has revived. I don't think you can give it too much water. Rhubarb is lovely, and it's wonderful to have all those things at the ready in the garden. Tonight I'll bring in some beets and peas from my garden. The tomatoes are still green, but before long they will begin to turn pink and then red. I can't wait! Anne: Nothing looks or tastes as good as fruit and veg straight from the earth. It makes all that work worthwhile. I hope you enjoyed your dinner. Wow, that's a full-time job! I've never been a gardener, except for a few potted tomatoes I used to grow on my deck at my condo. My grandfather had a huge vegetable garden when I was young and we ate from it summer and fall (and winter, when we had jarred tomatoes). It made me appreciate fresh vegetables and search out the best produce markets. I've never cooked with rhubarb, but I do love strawberry-rhubarb pie! Leslee: Strawberry and rhubarb sounds a really interesting combination. Today I made puddings to go into the freezer for Boxing Day; Summer Puddings, using all the fruit I could from the garden - except rhubarb. Summer Pudding was my English stepfather's specialty, which he made with his home-grown blackcurrants. It was delicious. He never thought of freezing it for Winter Pudding, though. He did, however, make it reasonably close to Boxing Day because that's when his blackcurrants were ready for harvesting. I'll have to type up that Rhubarb and Ginger Cake recipe, RR, but will email it to you when I've done so. Things have been busy here lately and I'm still catching up with last week. I have a Rhubarb and Date (or Sultana) Chutney recipe too, if you'd like it. Ha! Strawberry-rhubarb pie must be a North American thing. We often get a June bumper crop of strawberries, and I suppose rhubarb must ripen at the same time. It's delicious! Peregrina: Rhubarb seems to have generated a lot of interest, so it would be great if you could put the recipe up here for other enthusiasts. I don't make chutneys, but others might be interested. Many thanks. Leslee: How about your recipe here too? Maybe we should start a special rhubarb blog? Rhubarb roasted with a little sugar and then served with greek yoghurt for breakfast is good too. HHnB: I think we really need a special rhubarb blog! A friend has just told me that there is no rhubarb in France, and the word doesn't translate. Can this be right? Sacre bleu! Hello, Jan. It's a shame that loganberries seem in short supply. My canes have been wonderfully productive this year.